BATAVIA, Ohio (Sept. 12, 2016) – The number of suicide deaths in Clermont County declined dramatically to 19 in 2015, compared to 35 in 2014 and 31 in 2013. Lee Ann Watson, Associate Director of the Clermont County Mental Health and Recovery Board (MHRB), attributes that to more education about suicide prevention at Clermont schools, and more awareness of the county’s 24/7 crisis hotline, 528-SAVE (7283), which began in 2003. So far this year, there have been 16 suicide deaths. 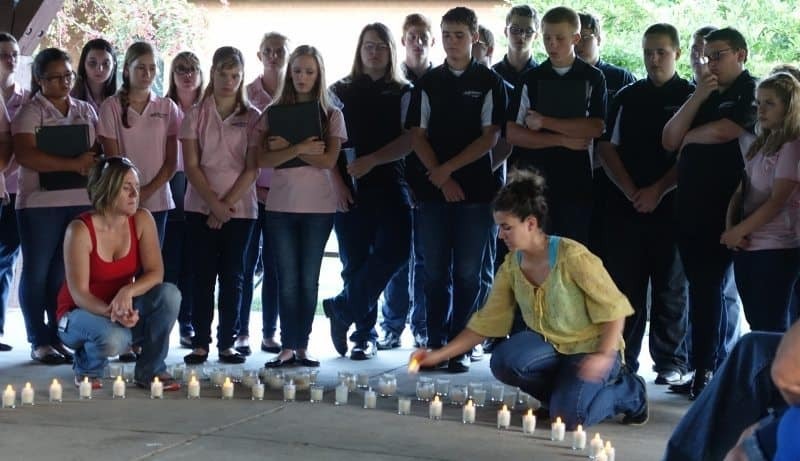 On Sept. 14, Clermont County will hold its 15th annual candlelight vigil to remember loved ones whose lives have been lost to suicide. The vigil will be held 6:30-8 p.m. at Union Township’s Veterans Memorial Park. MHRB has contracted with Child Focus, a nonprofit providing mental health services to youth and families, since 2003 to staff its crisis hotline. “Mental health professionals answer the phone and can assess whether a mobile crisis team needs to be sent out to the caller’s home,” Watson said. Child Focus employees and independent contractors staff the hotline; all have at least a master’s degree and are licensed as a counselor, social worker, psychologist, or chemical dependency counselor. Six hotline responders have been with the team since it began in 2003. In 2015, Clermont County Crisis Hotline answered 2,665 calls for help. That year, there were also 327 mobile crisis runs in the community, and 180 mobile crisis referrals were made by Clermont County law enforcement officers for follow-up, connection to treatment, and other needed resources. Through August 2016, Clermont County Crisis Hotline has taken 2,288 calls, made 224 runs, and received 130 referrals. Watson says MHRB has been zealous in promoting the 528-SAVE number. The number has been distributed to law enforcement agencies throughout the county, to Clermont Public Library branches, to doctors’ offices and Clermont Mercy Hospital, to high schools and at community awareness workshops. It has also been advertised on Clermont Transportation Connection buses. Child Focus also teaches a daylong seminar called Signs of Suicide at schools throughout Clermont County, Watson said. The training is offered to students and teachers, and has been conducted at Goshen, West Clermont and Milford schools. “Students are taught to recognize signs of suicides, either in themselves or a friend, and to talk to an adult who can help them,” she said. Clermont school districts interested in receiving more information on the Signs of Suicide program can contact Susan Graham at Child Focus, 513-752-1555.